Rosenfeld, Gavriel The World Hitler Never Made: Alternate History and the Memory of Nazism . Cambridge University 2005. Summary: Examines allohistorical and secret history representations of the Nazi era and their role in subsequent memory of the time period. Published: Cambridge University 2005 (0521847060w88 android), 2011 (1107402751BUY). Summary: Overview of the alternate history genre as it relates to Nazi victory in World War II, suggesting that has time elapsed the perception of the Nazis has become "less demonized". Comments: This essay was published just before the release of the author's book The World Hitler Never Made . Published: In San Francisco Chronicle May 8, 2005 (p. C-2). Summary: Includes two chapters on counterfactuals and alternate history that have appeared since the year 2000 on themes of Adolf Hitler and Nazi Germany, and how they reflect modern study and opinion of both the Nazi era and events in modern times. The first, "Probing the limits of speculation: counterfactualism and the Holocaust", addresses historical analysis suggesting that the Holocaust might have been averted and that the Holocaust was necessary for the creation of the state of Israel. 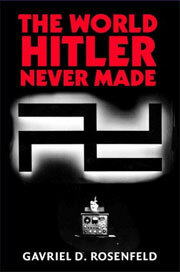 The second, "Nazis that never were: new alternate histories of the Third Reich", considers British, American and German novels and television programs featuring Nazi victories in World War II; and German novels and stories on the theme of Hitler's early death and whether Germany might have become a more moderate state. Published: Cambridge University 2014 (1107073995BUY, 110742397XBUY).